Kari Tauring is hitting the Heathen summer festivals and gatherings and is reporting back on her experiences in this series. This festival is the Northern Folk Gathering, former known as the Midwest Thing. The festival moved to a new location this year, St Croix State Park, and was held June 10-12. 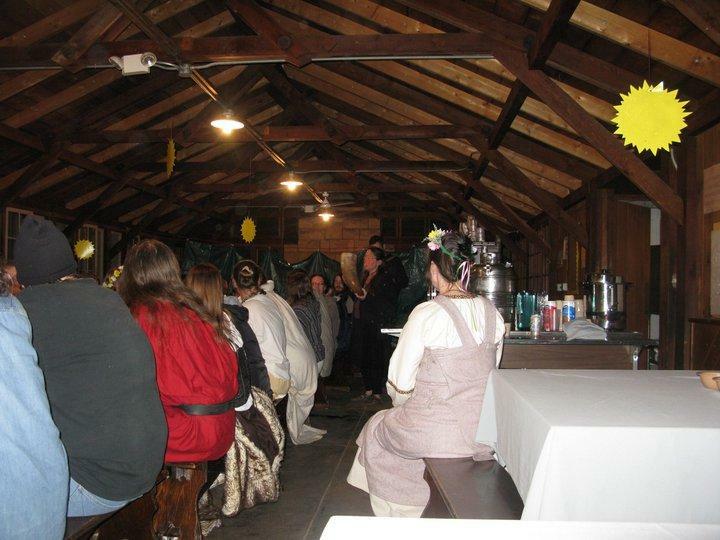 This was the first annual gathering of Heathen kindreds and individuals representing the Northern half of the Midwest. Hosted by Volkshof Kindred (out of Minneapolis) at Norway Point State Park near Hinkley, Minnesota. This three day event was attended by just over 100 people with about 30 children in tow. Though it was the first annual event by its name it was by no means the first event hosted by Volkshof Kindred and it showed in the organization, food, and fun that everyone enjoyed without a hitch. This mid-sommer festival was an opportunity for the kindred Chieftains (or leader representation) to meet and discuss issues within the Northern states and the region. The Gothis (god-persons or religious officials) of kindreds also met as well as the Valkyries (those women who serve the kindred as horn bearers, connecting the luck of the kindred to the wells of the world tree). The cabin camping at Norway Point is quite nice. Everyone was settled in a little “village” with the main hall being the center of food and festivity. There is a lovely swimming beach and lots of woods to wander in. Specific programming for the children was carried out through the event from workshops by Sara Axtel (Minneapolis, Powderhorn Cultural Wellness Center), members of Volkshof kindred and myself. I worked with the older kids teaching the Jim Johnston Norsery Rhyme “This is the world of Midgard” complete with dance steps, pantomimes, masks and a sun-disk parade. It was different than Trothmoot because the intention of the event was to bring the regional Heathens together to form bonds and friendship. So the emphasis was on festive activity such as a Maypole and flower crowns, hall decorations and a whole lot of dancing. I presented a performance program especially written for the event, “The Transformation of Groa.” Drew Miller (Boiled in Lead) came up for the show to add his magical laptop sounds and there were six staving women who performed a stav dance leading the human Groa into the mound to become a mound-bride. The childrens performance was a moment that the entire hall found exceptional. Here we are, modern humans of Nordic ancestry watching our children re-create the story myth of our deepest root. It is this realization that our ancestors are alive in our children that made this moment of the event a sort of pinnacle. Listening to each person in the hall raise a horn to their parents, grand parents, great grands…by name and by deed really marks a huge difference between general pagan events and heathen events. There is a deep understanding that we are creating the world for our children based on how healthy our relationships with our ancestors are. There is a sense in each raised horn that deep healing is going on in the family of origin issues we all face and that there is a commitment to maintaining a high level of functioning for our children’s sake. I find this compelling whether at a small kindred meeting or a large regional gathering. This path is for our ancestors and our descendants, not just for us here and now. Also, discussion was had on how this event could open up to individuals who, while not practicing Heathenry in a strict sense, are connected to heathenry through ancestry and interest. In Minnesota, our large Immigrant folksoul is beginning to seek their deeper roots and Heathenry is reaching towards the songs and dances of the Immigrant Era. A natural bridge is beginning to form and Volkshof Kindred is leading the way towards total folksoul healing. The site is already booked for the second annual Northern Folk Gathering and attendees said their fare well’s with “we will see you at LATP in September!” There is such a homecoming/family reunion feeling within these Heathen gatherings that growth is the natural outcome. I will be attending Lightning Across the Plains in Kansas this September for my third year. Last year I was recognized at the Midwest Thing held at LATP as volva (staff carrier) for the region. I look forward to reporting on it! Editor’s note: Interview with Brody Derks of the Thule of Volkshof Kindred, about Heathenry and the Northern Folk Gatheringcan be found here. Kari’s report on Trothmoot 2011 can be found here. Pingback: The Wild Hunt » Pagan Community Notes: Summer Festivals, COVR Awards, Pagan Families, and more!